In your fashion journeys, you’ve undoubtedly come across the military designation OG-107. 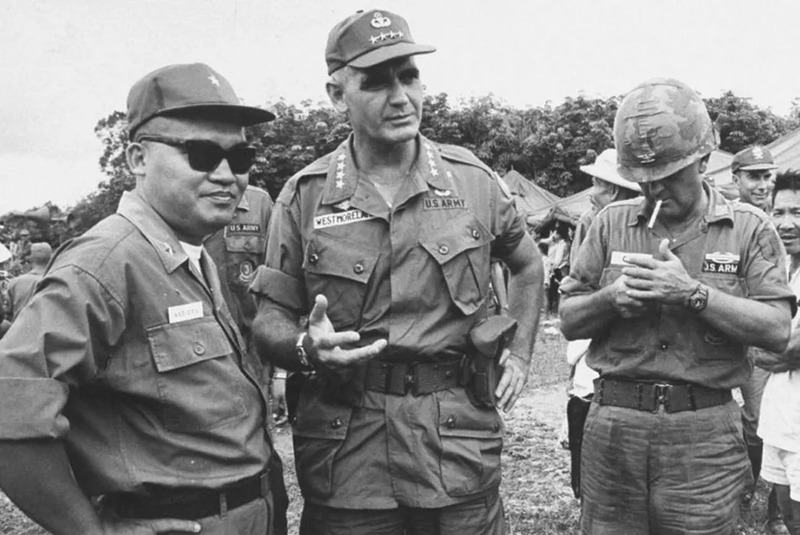 If you’ve been pretending to know what it means, you’re in good company, such good company in fact, that we’ve chosen to do a writeup on this most ubiquitous of American military uniform pieces, as you can see above on either side of famous napalm-enthusiast, General William Westmoreland. Named for its classic shade of 8.5 ounce Olive Green sateen (hence OG), the OG-107’s pared-down design continues to make it a wardrobe essential, even 41 years after the simple outer-shirt’s honorable discharge. Today we’ll track the history of the so-called Cotton Sateen Utility Uniform and attempt to understand its enduring popularity. The OG-107 uniform came on the scene in 1952 and would see three distinct phases until it was finally phased out in 1987. While this article focuses mainly on the “jungle jacket,” or the shirt, the OG-107 was actually a full uniform, complete with pants of the same color. OG-107 uniform Type I. Image via Moore Militaria. While the preceding WWII era uniforms look distinctly old-timey, the OG-107 has a more contemporary military feel. The jungle jacket shirt is very plain, with two simple chest pockets and plain sleeves without any buttons or fastenings at the cuff. This was then tucked into straight leg fatigue pants, whose only real details were patch pockets in front and two pockets, with similar button closures to the shirt. The pants were originally manufactured in Small, Medium, and Large sizes, which necessitated waist-band adjusters for the sizes in between. The OG-107 was manufactured in its first iteration from 1952 until 1963. Despite this, the earliest version of the uniform would be the one most often seen in pictures of American troops in Vietnam. As always, distributing uniforms was a haphazard and bureaucratic affair. OG-107 Type II. Image via Moore Militaria. Produced for a single year: ’63-’64, the Type II OG-107 wasn’t very different from its predecessor. The only marked change was the corners of the chest pockets have been “clipped.” Giving them an ever so slightly different shape. Why this was deemed crucial is unclear, but if you find one of these while vintage shopping, buy it! Its comparatively short production time makes this the rarest of the OG-107 variants. John Lennon in a Type III OG-107. Clearly the American military isn’t familiar with the concept of not fixing stuff that “ain’t broke.” The third and final version of this classic uniform was made from 1964 to 1989 and is by far the most common of the various OG-107 editions. This time, more changed than just pocket shape. Yes, the pockets changed too, from their clipped corner design to a more pointed version, but buttons were also added to the sleeves. The third edition of the uniform saw the removal of the adjustor tabs on the pants and the introduction of more accurate sizing. The late 70s brought the OG-507, which was essentially the same thing, just in a cotton-poly blend. The OG-107 is perhaps most closely associated with the Vietnam war, but was considered the standard Army uniform for most soldiers at home and abroad. The famous OG-107 worn by John Lennon was given to him by a soldier who had clearly served in Korea, it features the Imjin Scout Regiment Patch, awarded after going on 20 patrols of the DMZ. The Vietnam connection notwithstanding, the OG-107 would have been frequently worn by American soldiers doing various kinds of Cold War-era garrison and patrol duties. The OG-107s began being phased out in Vietnam in 1967, when non-special forces were permitted to wear “Jungle Fatigues.” After this point, the only soldiers to wear the OG-107s were back stateside or doing tours of duty in other countries outside of Southeast Asia. You can see, even in the pictures of Vietnam, that some soldiers are wearing the OG-107 utility uniform, while others are wearing the more modern Tropical Combat Uniforms (think BDUs). The newer lightweight uniforms might have been better-suited to hot and humid combat locales, but they were lighter than the OG-107 and tended to break down much faster, stretching American supply lines. Vietnam Veterans march in Lexington, MA in 1971. Image via Mass Moments. As a garment, the OG-107 is simple and not especially good-looking, but like all uniform pieces associated with the wildly unpopular war in Vietnam, it gained new meaning back home. Tropical combat uniforms were more glamorous with their asymmetrical pockets, but before 1967, they were worn by the more gung-ho special forces units. The OG-107 was the real GI’s uniform. While the draft wasn’t enacted until 1969, army uniform distribution moves painfully slowly, so it’s quite possible that new, unwilling soldiers were the ones wearing the cotton sateen utility uniform. When those same veterans returned home to protest the unjust war, they brought back their olive green duds, turning them into symbols of rebellion rather than acquiescence. OG-107 at the beach. Image via Knickerbocker Social Club Instagram. If you want an original OG-107, your best bet is your local vintage store or flea market. They’re certainly out there. But there’s no shortage of modern repros to choose from as well; Stan Ray, Orslow, and Toys McCoy all offer their own takes. Orslow’s “Army Jacket” via End Clothing. If you’re looking to check out more military outerwear, have a look at our guides to U.S. Field Jackets and Flying Jackets.